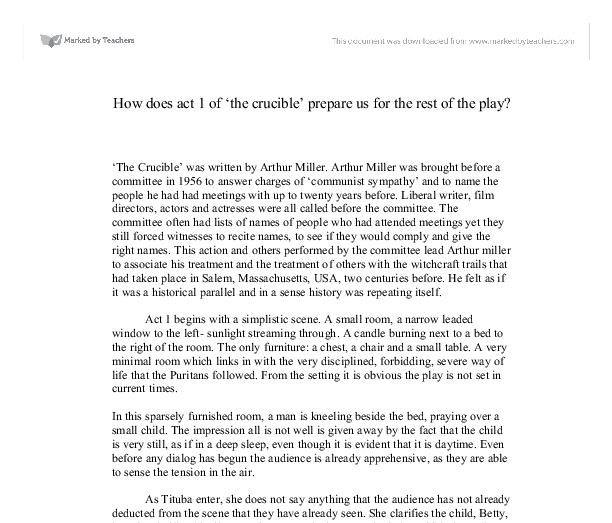 How does act 1 of 'the crucible' prepare us for the rest of the play? How does act 1 of 'the crucible' prepare us for the rest of the play? 'The Crucible' was written by Arthur Miller. Arthur Miller was brought before a committee in 1956 to answer charges of 'communist sympathy' and to name the people he had had meetings with up to twenty years before. Liberal writer, film directors, actors and actresses were all called before the committee. The committee often had lists of names of people who had attended meetings yet they still forced witnesses to recite names, to see if they would comply and give the right names. 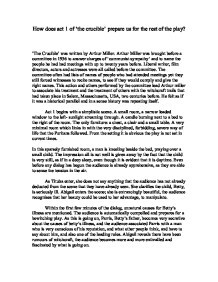 This action and others performed by the committee lead Arthur miller to associate his treatment and the treatment of others with the witchcraft trails that had taken place in Salem, Massachusetts, USA, two centuries before. He felt as if it was a historical parallel and in a sense history was repeating itself. Act 1 begins with a simplistic scene. A small room, a narrow leaded window to the left- sunlight streaming through. A candle burning next to a bed to the right of the room. ...read more. The audience is automatically compelled and prepares for a bewitching play. As this is going on, Parris, Betty's father, becomes very secretive about the causes of betty's illness, and the audience associated Parris with a man who is very conscious of his reputation, and what other people think, and have to say about him, and also one of the leading roles. Abigail reveals there have been rumours of witchcraft, the audience becomes more and more enthralled and fascinated by what is going on. From the beginning it is apparent to the audience that Abigail is lying to her uncle, and at times it is even blatant. She delivers excuse after excuse, as if it had been practised, to convince Parris of their 'innocent dancing'. The audience is able to conclude that Abigail is a very skilled fabricator, and that this will undoubtedly lead to trouble. Mrs Putnam eventually enters, and tells that her daughter is also ill. She says her daughter flew, Abigail denies it. Mrs Putnam reveals that seven of her babies have died at birth and Ruth, her ill daughter, is the only one surviving. ...read more. Betty eventually rises and tells of how Abigail drank a charm of blood to kill Goody proctor. Abigail leaps into dialog saying: 'Let either of you breathe a word, or the edge of a word, about the other things, in the black of some terrible night and I will bring a pointy reckoning that will shudder you', the threat is serious and the audience now know Abigail's full potential. She goes on to say: 'I saw Indians smashing my dear parents' heads on the pillow next to mine, I have seen some reddish work done at night.' Abigail is an orphan, and probably bears mental scars from seeing her parents' dead. The audiences have previously heard of how Abigail was discharged from working at Goody Proctor's service. The audience wonders what has gone between Goody Proctor and Abigail, this prepares the audience for the future story lines. John Proctor enters and the tale of his affair with Abigail unfolds. This is a change in themes in the play, from witchcraft and unnatural goings on to jealousy, deceit and hatred. This opens another plot line within the story, and prepares the audience for a wider variety of issues. ...read more. The supporting points should prove or illustrate the main points. The number of supporting points should be limited to a number between two to seven. It is also recommended that the supporting graphics be defined at this time. Outlining the presentation-Completing an outline of the presentation is recommended in order to completely define the scope and logic of a presentation. they saw. Whilst this is happening passis is shouting a prayer of thankgivening and hales stating that the speel is broken and thet they are free. The curtains fall and act 1 ends. Act 2: the plot Eight days later the scene starts at john proctors house. also implies that there is something of a residing childish nature within Tony. A list of Tony's pranks are then reeled off by Mr. Hardcastle, and these are comedic (which is amplified by his disapproval of them), 'If burning the footmen's shoes, frightening the maids, and worrying the kittens be humour, he has it. was effective as it set the scene for the rest of the piece of drama. It showed lots of people in situations involving alcohol which showed that alcohol affects everyone in some way or another. We also used music; we used this to represent the actual crash. For example when each of us were introduced we all gave completely different impressions; you had the quiet one that started the play off the happy and smiley one and the stuck up one. Maybe these impressions wouldn't have been highlighted as much if it weren't for the dramatic difference between each other. Secondly, the personality of a character can be accentuated through use of lighting. If you shine an underlight on an evil character you will give their face an ominous look, with shadows on the face so that expressions and facial features cannot be seen clearly.